The airport and gate were very quiet. In fact, when boarding the flight to Bangkok there was practically no one near our gate. 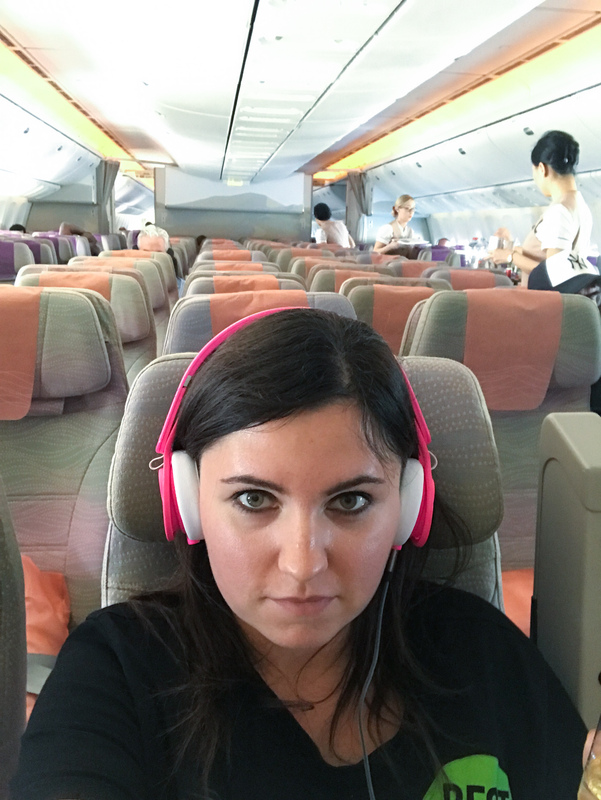 Considering we were flying from the Dubai airport, I was surprised that the flight was so empty. Although at the same time I didn’t mind this as I could take any seat I wanted too or even lay down across the seats. I could pretty much do anything I wanted (well within reason). 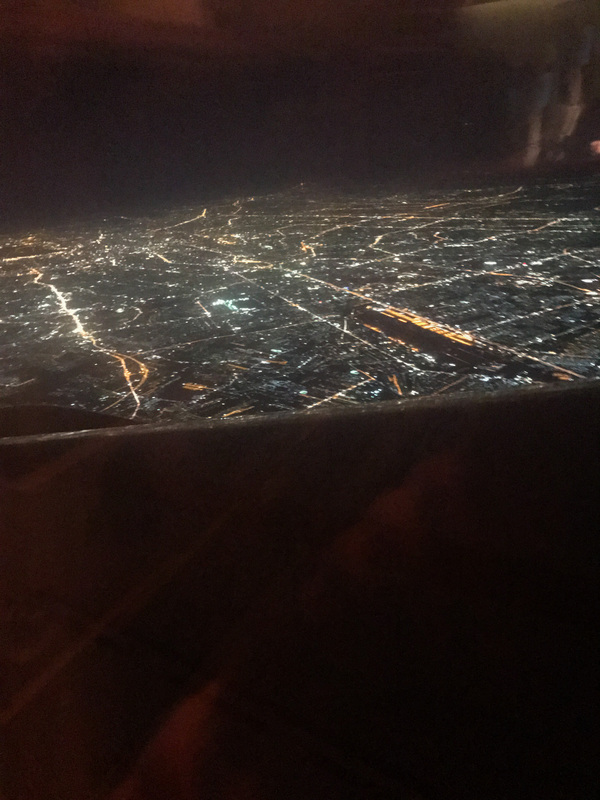 After flying 6 hours from Dubai on an empty A380 we landed in Bangkok. Upon landing in Thailand my first impression was a bit confusing, as we were driving for such a long time on the highway to get to the city. Throughout the drive the initial outskirts of the city were a little bit depressing. All I was able to see were grey buildings, rubbish and crazy drivers. 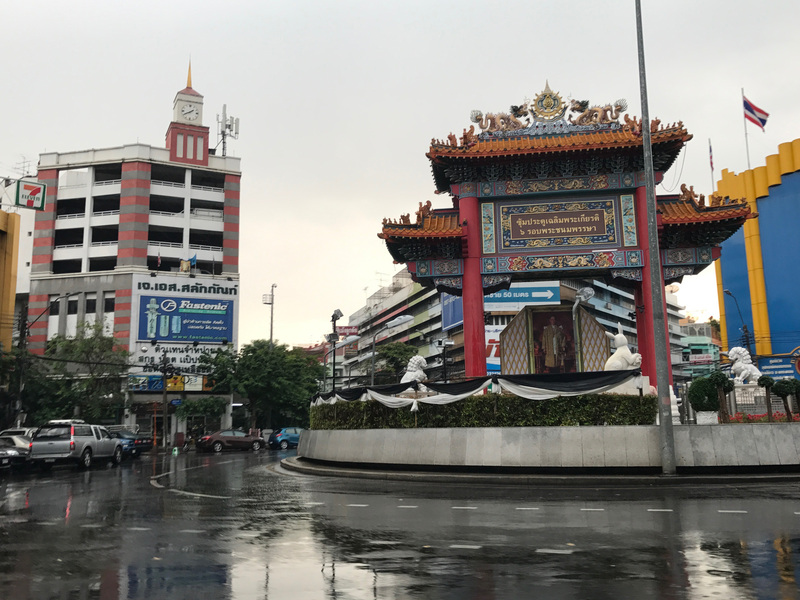 I was wondering where are all the beautiful Thai colors and architecture that we all hear about were. 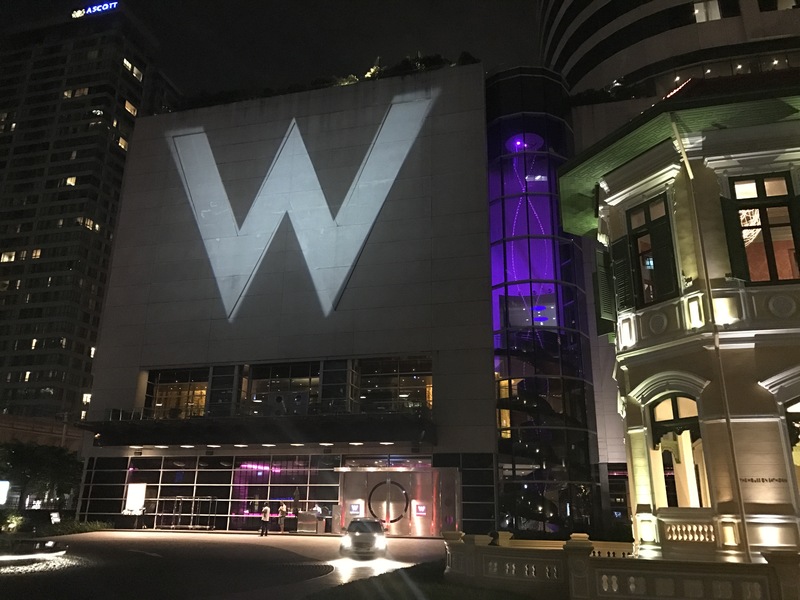 After racing down the highway in the taxi, we arrived at The W Bangkok, which was our hotel for our time in the city. 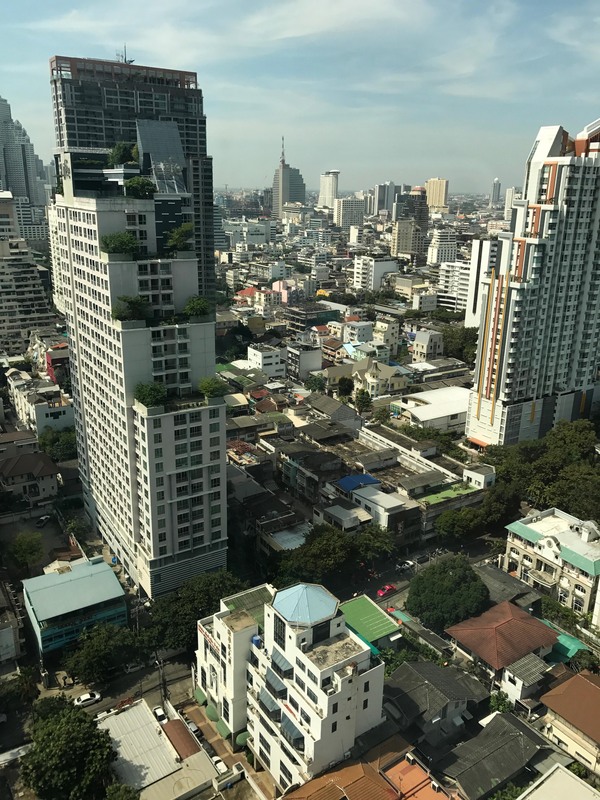 It was located in the financial district of Silom. The hotel looked very modern and different than the pictures we saw online, I didn’t know what to expect. As soon as we entered the lobby we heard loud music from the bar. We saw wonderful purple colors, and lights all around. I know some people wouldn’t enjoy this but we knew right away that we made the right choice. It was definitely a different kind of hotel; we absolutely loved it from first sight. Since it was already late, I quickly checked where we could get something to eat. 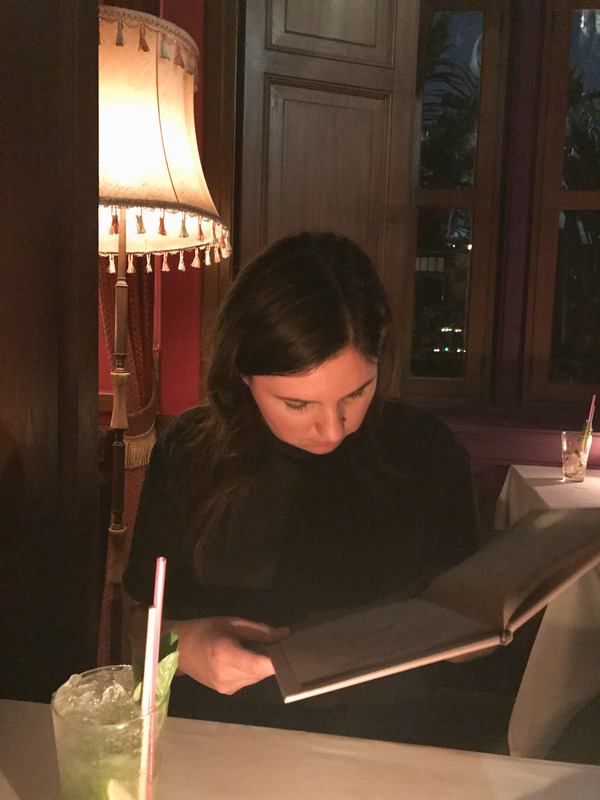 I was very excited to finally try my favorite Thai kitchen in Thailand. We decided to go to a restaurant called Namsaah Bottling Trust, which if you didn’t know better when walking there at night it feels like your walking down a street to wind up eating at a very interesting bed and breakfast. The atmosphere, music and drinks were great; however, the food left something to be desired. My chicken looked like it wasn’t cooked all the way and it had a lot of fat. I soon realized that we fell into a trap when the bill came. It was almost £70 for three drinks and 2 main dishes! Now in London, yes this would be very reasonable, but in Thailand I was envisioning the food and drinks being a bit cheaper. After intense sightseeing in Dubai and all the traveling we decided to spend Friday morning by the pool. We just wanted a moment to lay down and relax. We got some drinks and food and after we recharged our batteries, we went for a walk around the city. 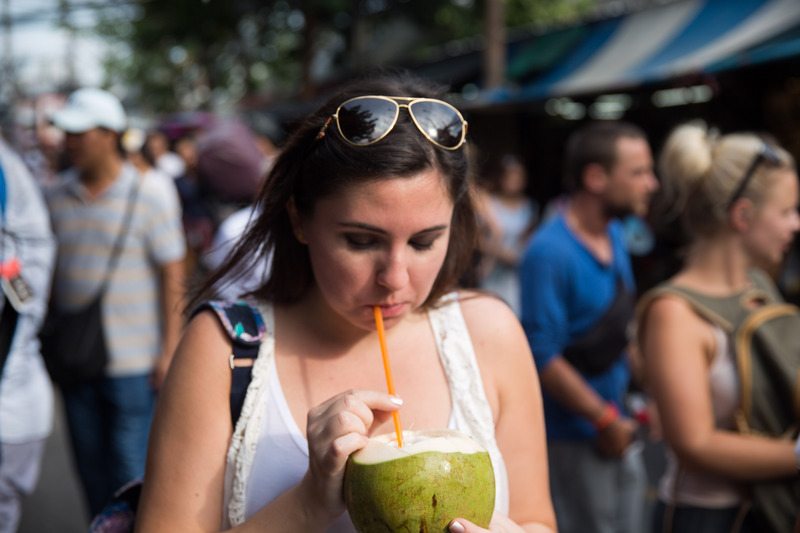 Our goal was Khao San Road, the famous backpackers street which was about 7km away. Of course we got a bit lost on the way. I love walking but it was so difficult to walk safely on the Bangkok streets. It seems as though people have no rules when they drive, especially motorcycles. Also, in most places there are no streetlights. In spite of everything I loved it. 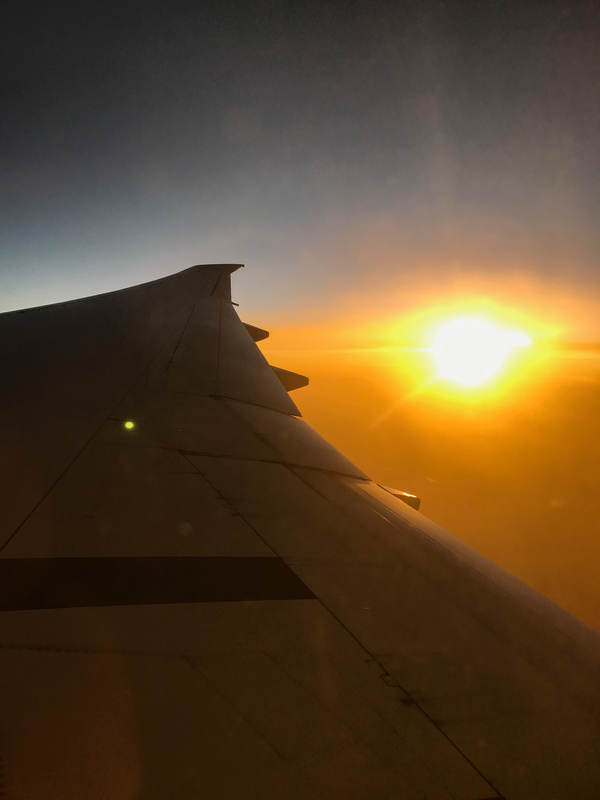 I got to see a completely different world to the one I know. 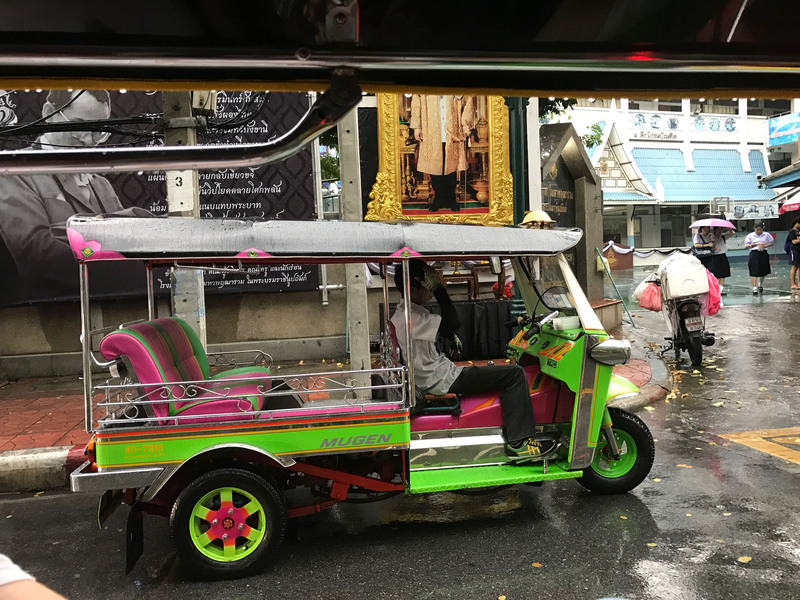 There was street food everywhere, people were smiling for no reason, tuktuk drivers would stop almost every minute to ask if we needed a ride, and there were a few wonderful, colorful buildings. Khao San Road was everything I read about. Street food, shops with fake stuff, and of course people trying sell you everything under the sun. There were loads of bars with beer towers or vodka buckets. It was a great atmosphere and definitely an amazing place to spend your Friday night. However, since this is a backpackers street, there is a party going on just about every night of the week. After a few drinks everyone makes friends and dancing together in the middle of the street is not an uncommon site. 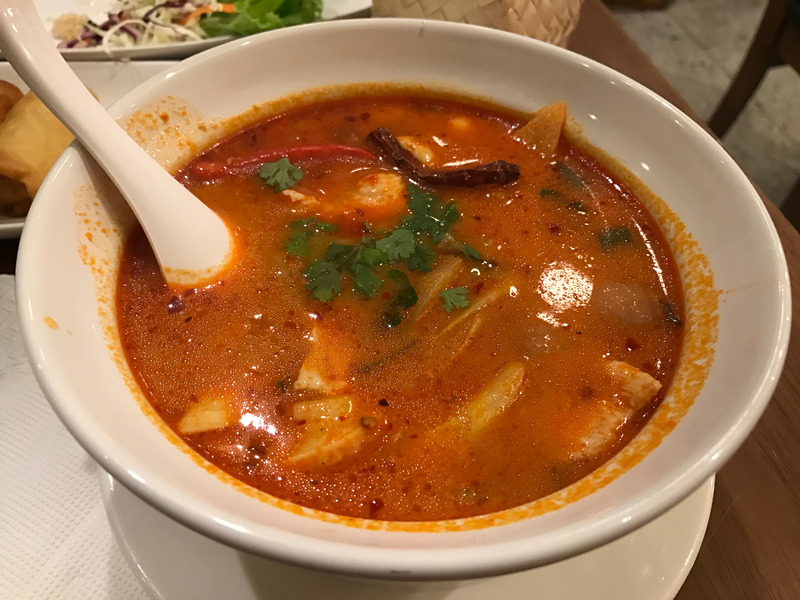 We had a dinner there in place called Tom Yum Kung which was much better than Namsaah Bottling Trust and very cheap. The next morning we went shopping at one of the big shopping centers called MBK where you can buy anything you want: Clothes, watches, shoes, bags, electronics, mobile phones, cameras and souvenirs. 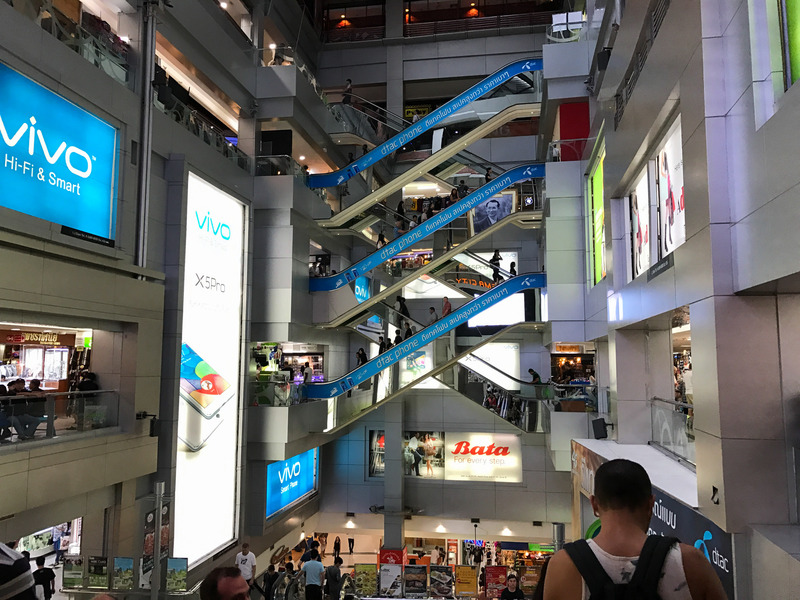 The mall itself spanned over 8 floors. I would say it could take you a good day to walk around the whole thing. Many of the smaller shops tend to have the exact same thing as the shop next to it. 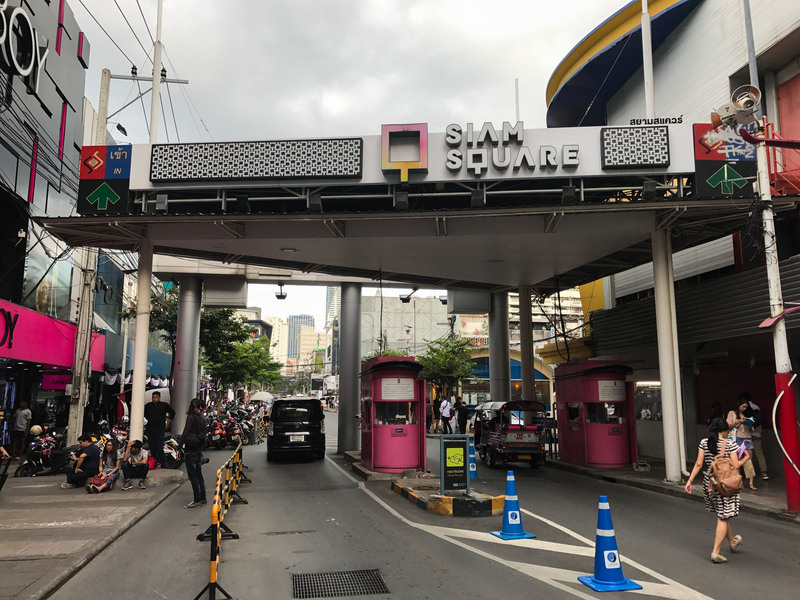 We spent a few hours there and then we moved on to Siam Square where you can find regular shops like Zara, HM, popular tourist restaurants like Hard Rock café or fancy shops like Armani, Gucci etc. 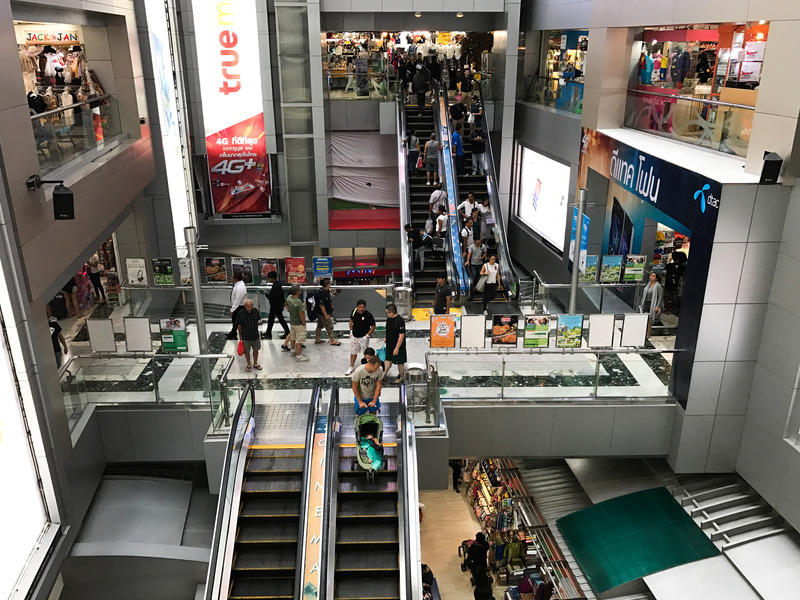 in Siam Paragon, which is the part next door. I was impressed by the size of the shopping areas here. You could easily spend a whole week shopping here. 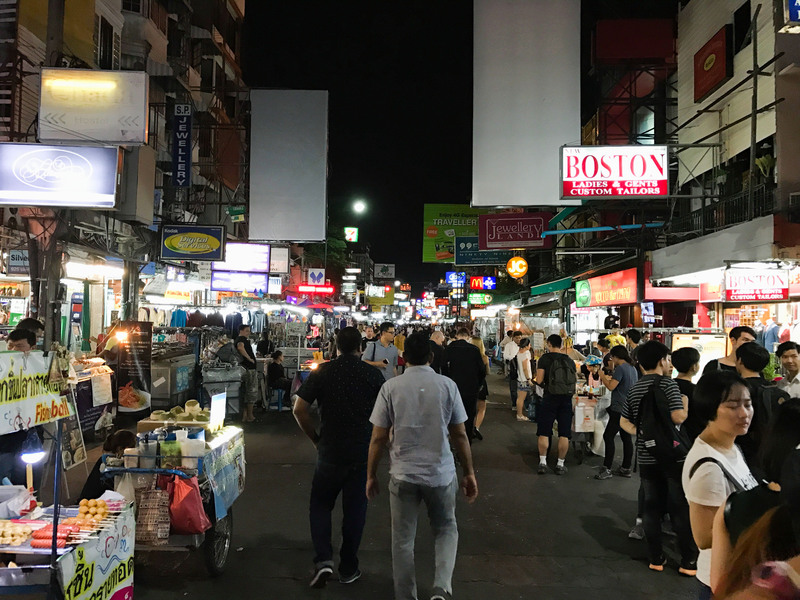 In the evening we went back to Khao San Road to meet up with some friends we made the night before. 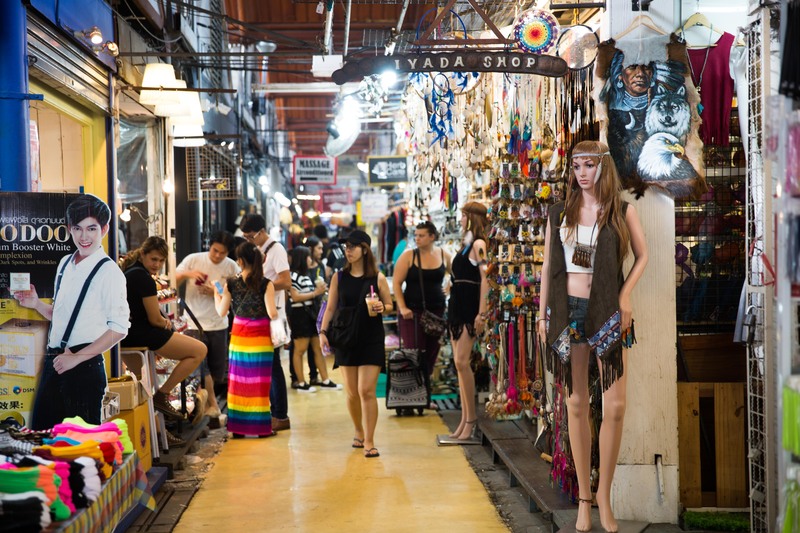 No visit to Bangkok would be complete without a visit to Chatuchak market, which is the largest market in Thailand and open on weekends. You can get everything there at very good prices; like antique wood carvings, handicrafts, ceramic wares, garden plants, stones, clothes, accessories, silk, fabrics, furniture and lots of other stuff. 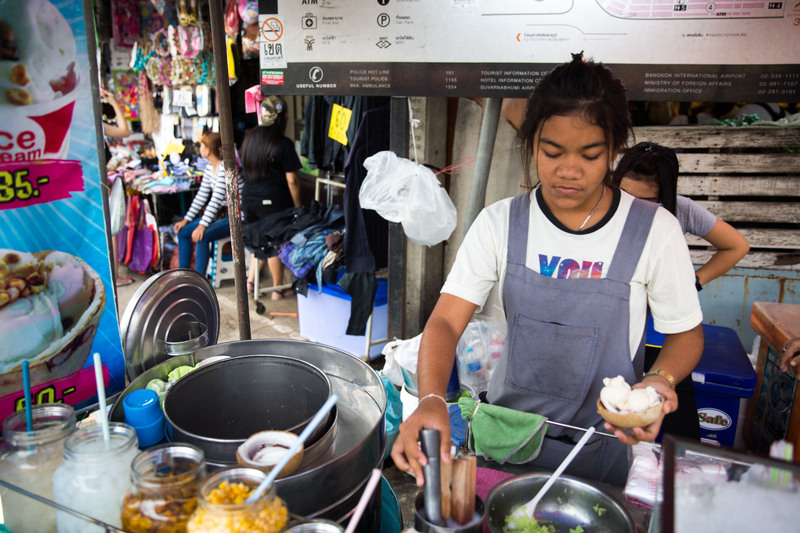 You can also get food, or Thai massages at the market. 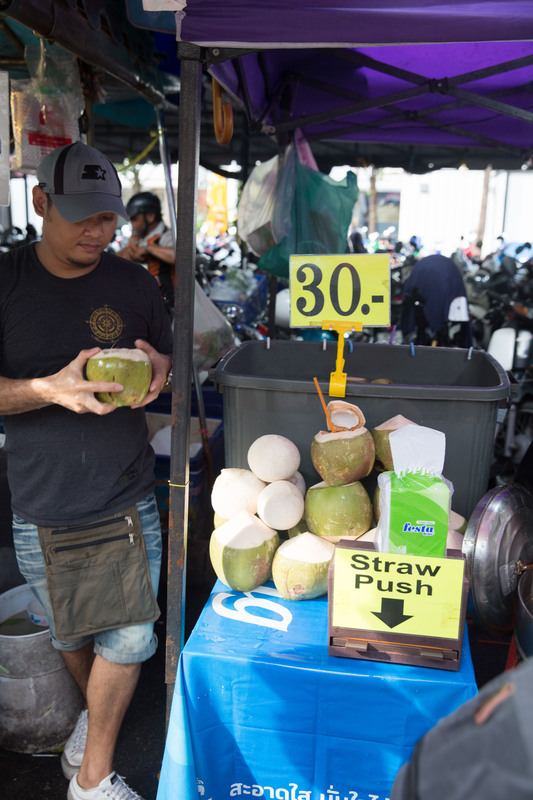 It was very big and the day was quite hot so after few hours of shopping and drinking a few fresh coconuts we made our way back to hotel. 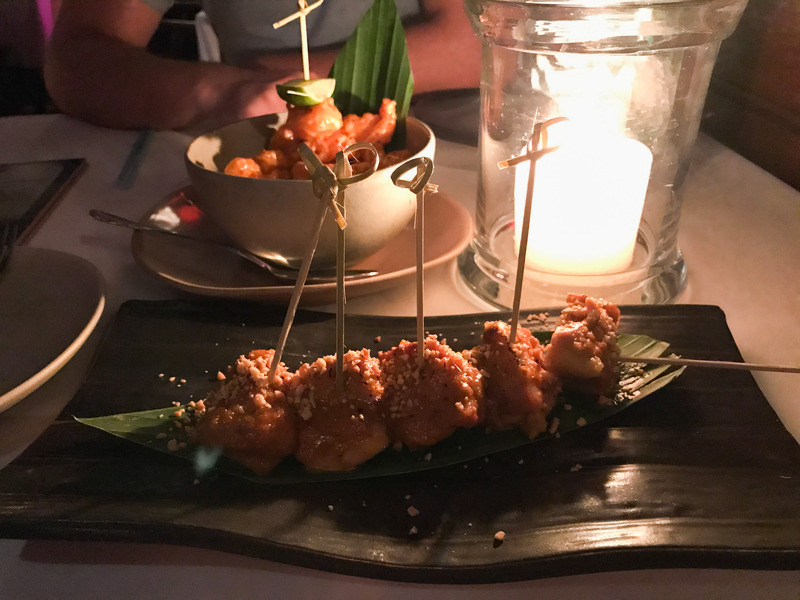 We were starving so we went to a restaurant nearby called Nalin Kitchen which was a little small Thai restaurant. It was very good! 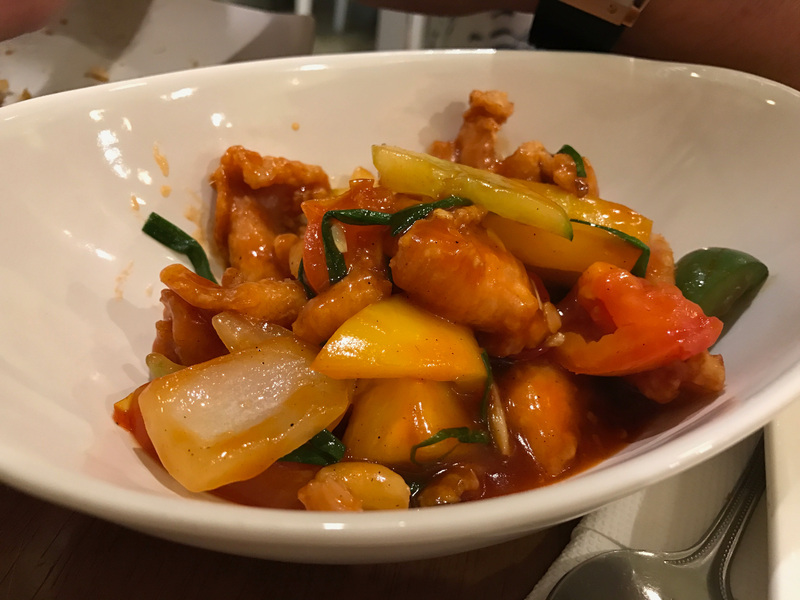 The service was great, it was very clean, the food came very quick and it was delicious. 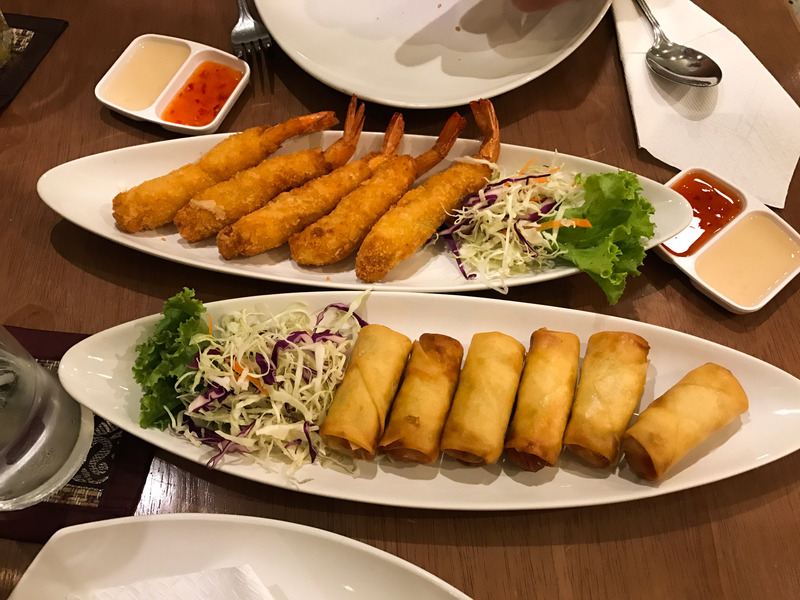 We ordered vegetarian spring rolls, fried shrimp, sweet and sour chicken with sticky rice, Tom Yum soup with chicken and fried rice with chicken along with tea, water and two beers. We got all of this for around £20! Nalin’s kitchen is definitely worth a visit! After we ate we walked around for a bit near the river before heading back to the hotel. 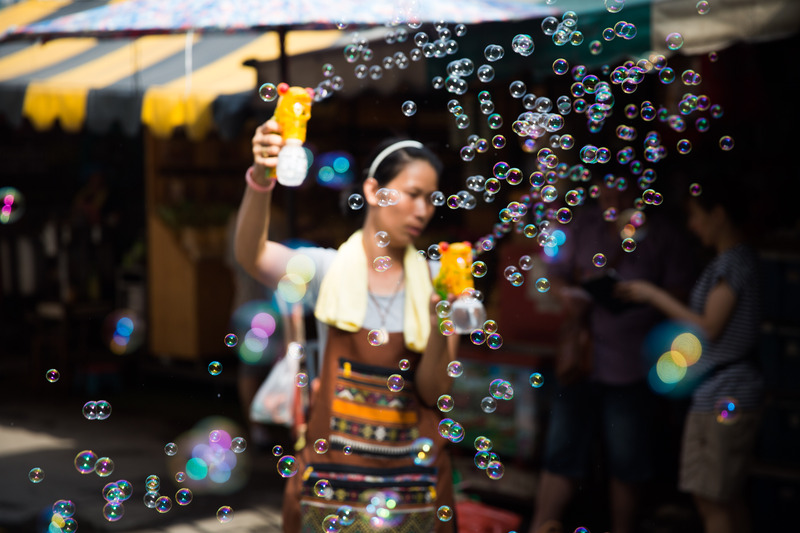 While we spent the first 72 hours in Bangkok wandering the city, soaking in the pool and night life, we planned a more intense exploration of the city, temples, and other sites for the days to come. I wish I was still in Bangkok, but back in London now. I was planning on visiting Yaowarat Road but will have to do that next time, thank you for the tip! 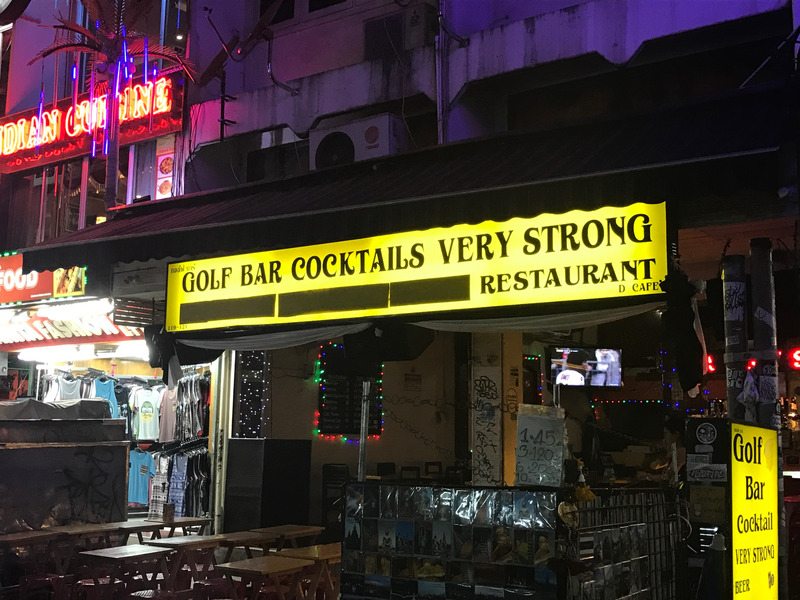 A friend of mine was in Bangkok and photographed that same “Golf Bar Cocktails Very Strong” sign, except the three words below weren’t blacked out. Too funny. 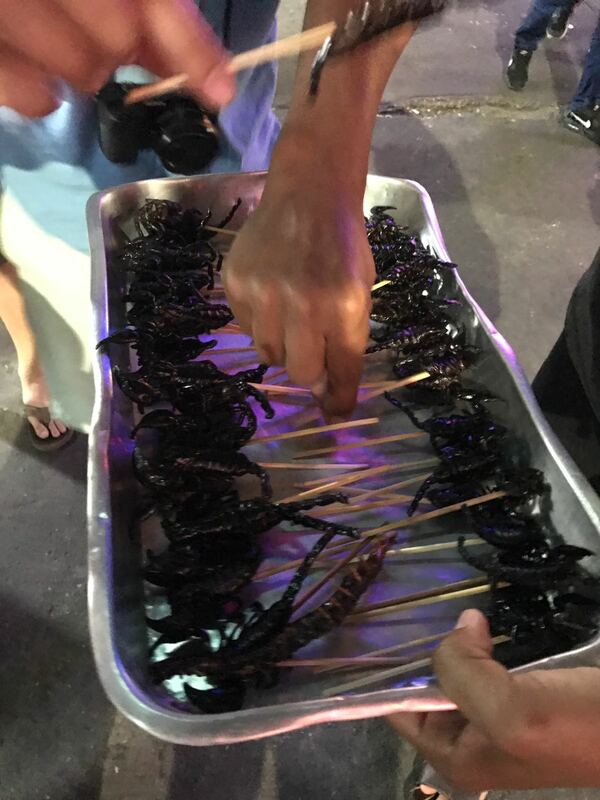 love Thailand and the people, Bangkok is a wonderful crazy city, now I really want some Tom Yum soup! Wow What brilliant place to explore I loved the look of the market. Your pictures are good and I really enjoyed your descriptions. Thank you Debbie, that really means a lot. I love all the colors and activities captured in this photo! Thailand is on the shortlist for me ‘big trip in 2017 and your first 72 hours alone have convinced me to bump it up to the top! Awesome, where else are you thinking of going in 2017? Wow! I have never been, but it looks so interesting! Thanks Nicole, I definitely recommend visiting! That looks like an incredible experience. Definitely peaked my interest.